Every 3 years, I am asked to present my flower arrangement at the annual Consulate General of Japan Year-end party. My turn had once again came this year. I wanted to showcase a “Tsuri-Bana” using Mangetsu (Full moon) container. 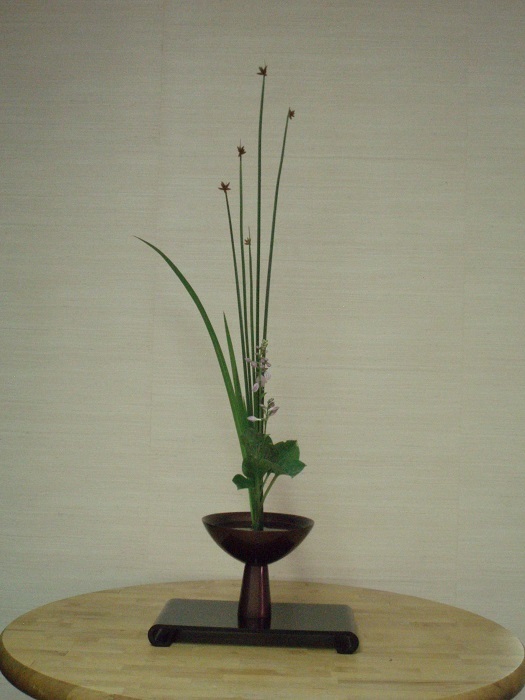 It is a simple (Wabi Sabi) arrangement. But, the size is small, and I have to have something to hang the Mangetsu container. So, I decided to make a Byoubu (paper-screen room devider) Japanese screen with windows. I had brought Japanese Fusuma paper with flower patterns from Japan, with which I made the two-fold Japanese Byoubu. It took about a week to make this byoubu from scratch. The windows are shaped in hexagonal shapes, indicating Ikenobo’s Rokkaku-do Temple in Kyoto, Japan, the originating place of Japan’s Ikebana flower arrangement more than 550 years ago in 1460’s. Because Mangetsu container is made of copper, I wanted to use a gold-colored container and a silver-colored container to complete Gold, Silver and Copper theme. 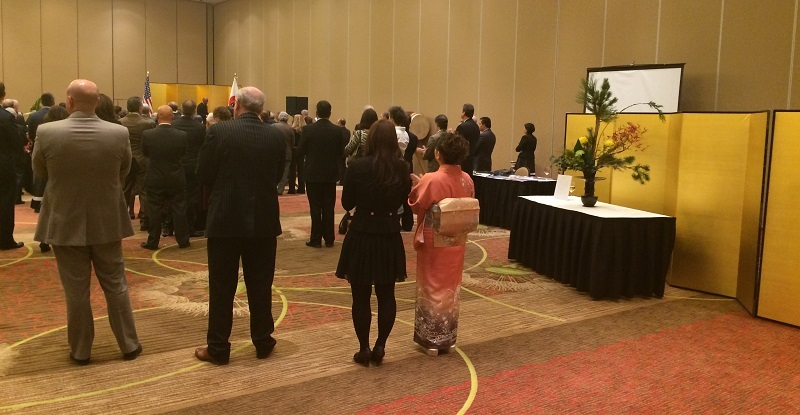 Every December, Consulate General of Japan holds an annual party at Sheraton Denver Downtown Hotel. It is a time to thank the good relationship between local officers, business people, and others with Japan. The event is also called the Emperor’s Birthday Party, commemorating the current emperor’s birthday on December 23rd. 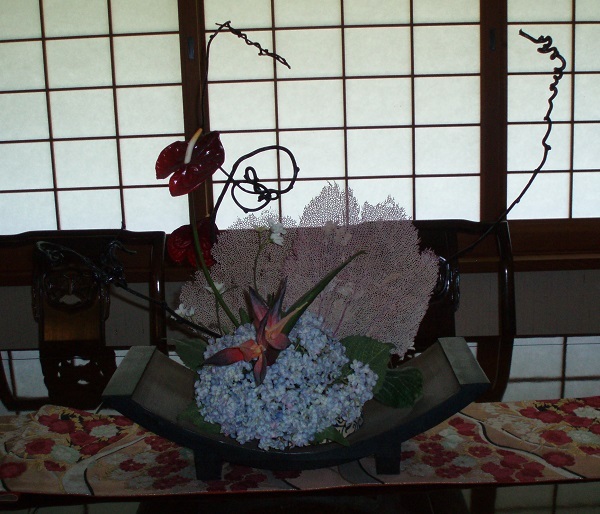 Through Ikebana International Denver Chapter (#66), one of senior teachers from three of Japanese Ikebana Schools, Sogetsu, Ohara and Ikenobo, are asked to present flower arrangements for this event by Consulate General of Japan, taking turns every three years. This year was my turn. Three years ago, I had a Rikka Sunamono arrangement. This year, I had an inspiration from the Emperor and his wife as a couple, who turned 81 years old and 80 respectively. 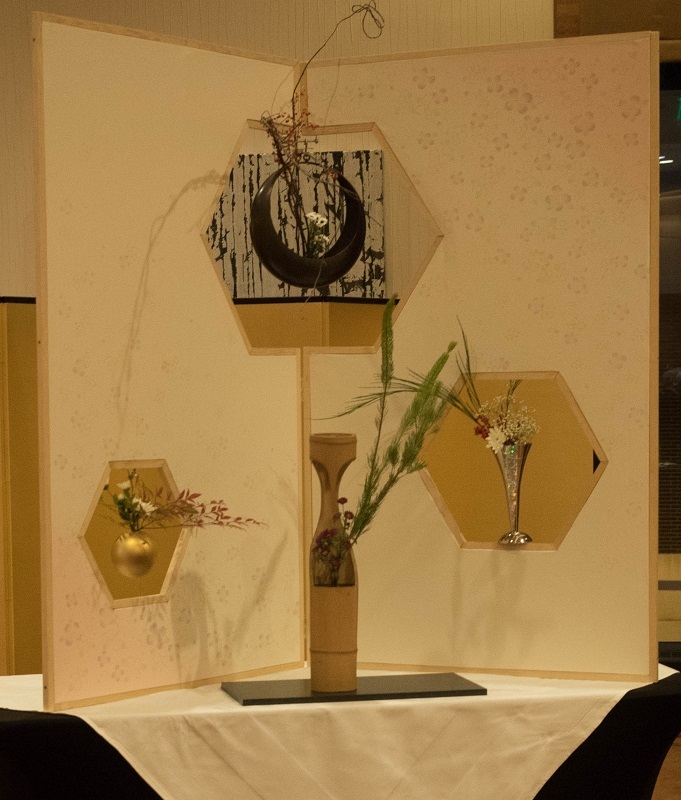 To show the respect for the Emperor couple, I had prepared the Awase-Shin Rikka, which uses two different types of pines combined for Sugu-Shin, the middle tall pine(s), and is presented at a formal, happy occasion such as a wedding ceremony. “Awase-Shin” means the “Combined, Coupled, Together, United”. Normally in Japan, Black Pine as a symbol for male and Red Pine as a symbol for female are used to construct the “Awase-Shin”. But, in Colorado, I used the local Ponderosa pine and Mugo pine for this arrangement because I could not obtain Black and Red pines. I hope this combination-arrangement shows the respect for the Emperor couple and wishes both Emperor’s and his wife’s longevity. This week, Kazuko made a 3-material Shoka arrangement for the Kimono Show at TACtile, originally planned with Rush and Wild Iris from nearby ditch and Anthrium, for summer cheerfulness. Unfortunately, Anthrium was not available. And, Blue Hosta which was blooming everywhere outside the house was used instead. This weekend’s Kazuko’s Shoka flower arrangement for the 2nd week of TACtile Kimono Show is One-Material Shoka using Veronica. There was to be a tea celemony during this weekend at TACtile. So, Kazuko thought a quiet shoka was more appropriate than Rikka for the event. Kazuko was asked to present the flower arrangement for the Opening of Kimono Show at TACtile, Textile Arts Center at 1955 South Quince Street in Denver from June 28 through June 29, 2013. She presented this Rikka (Kusamono Rikka). She will teach the Oshi-E workshop classs from 1pm to 3pm on July 21, 2013, and the Furoshiki workshop classs at TACtile from 1pm to 3pm on August 3, 2013.
for workshop details. Please call TACtile to reserve a seat. Rikka Introduction – Level 3: the minimum of 5 lessons. After these “Introduction” lessons, which consists of the minimum of total of 15 lessons in the time span of 2 to 3 years, a student would have mastered the basic techniques of Rikka. Several of my students are currently at the stage of the third to fifth lessons of Rikka Introduction – Level 1. From my teaching experiences with my students, it seems 10 lessons or so may be needed for each Level before proceeding to the next Level. A student who completed the above introductory classes can proceed to the intermediate classes of Rikka (Shofutai). The intermediate classes teach about 30 different traditional Rikka arrangements (theme), based on the instruction book “7 Tips for Material Usage & 19 Rikka Motifs (Themes)”. A student would learn each style by taking a couple of lessons for each arrangement (style). This process would normally take 4 years or more. Then, the student can proceed to more advanced and creative level of Rikka, taking such large-scale arrangement as Mikizukuri Rikka and Rikka Sunamono. The master-level Rikka arrangers could further proceed to the Okuden level of Rikka after learning the most of advanced level motifs (themes). Separately, a student who has completed the Rikka Introduction – Levels 1 through 3 can start to work on Rikka Shimputai. 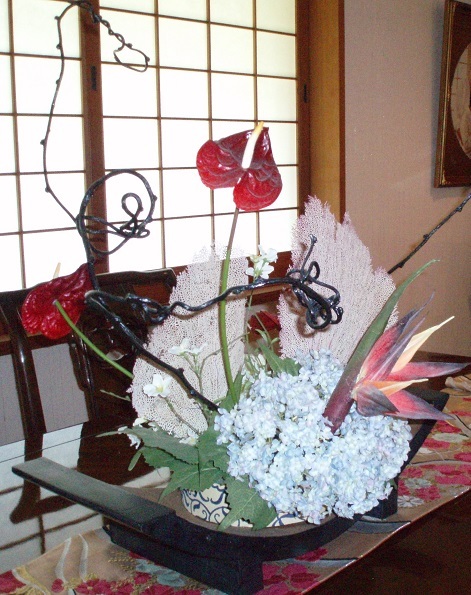 Kazuko made the following center piece with artificial flowers and a couple of pink coral reef leaves. This was a commissioned art work for a customer.